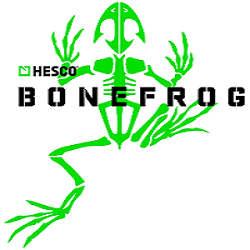 The HESCO BONEFROG is truly a unique experience. With 50 Navy SEAL-style obstacles on courses that range from 3-9 miles, the course will test everyone and leave no one unscathed. We attempt to place an obstacle approximately every quarter mile (when venues permit), so your running ability alone will not carry the day. You must be functionally fit to succeed here. You will get muddy. You will get beat up. You will be exhausted. But you will finish. As Navy SEALs, we know what tough is – and we don’t mean Harvard. The HESCO BONEFROG was created by Navy SEALs to challenge, build and inspire participants to become better athletes and recognize that they can do anything they set their minds to, while enjoying the camaraderie and teamwork usually reserved for active duty Navy SEALs. The HESCO BONEFROG is truly a unique experience. With 50 Navy SEAL-style obstacles on courses that range from 3-9 miles, the course will test everyone and leave no one unscathed. We attempt to place an obstacle approximately every quarter mile (when venues permit), so your running ability alone will not carry the day.